It was a near-perfect sunny day when we met activist and community organizer Megan Anderson at her go-to spot, Wyoming Community Coffee. The naturally lit, bright and open coffee shop is the perfect mirror for Megan’s warm and inviting personality. She greeted me with a smile and, almost immediately, we launched into a friendly conversation about frustrating Cincinnati commutes, good coffee, and the lovely but fleeting spring weather. The conversation was so easy we almost forgot the purpose of our meeting, which was to capture the story of this bold, funny, and compassionate woman. Interview by Jackie Mulay. Photography by Chelsie Walter. Why don't you start with your elevator pitch? Tell me a little bit about yourself. I was born in 1977, and in 1979, I was diagnosed with a motor neuron disease. So I've always known that rapid change in my physical self, sort of noticing the progression of the disease. I think when someone asks, "What got you into advocacy or being an activist?" to me, it’s not asking for assistance to fix my sleeve or asking for someone to get my bank card if it's fallen right before I pay. But at a young age, it was learning how to get the job done and make sure my needs are met. When you talk about speaking up for yourself at a young age, can you pinpoint a certain moment where that transitioned into more formal activism? I guess the first time I noticed that I was wanting to sort of [speak up] was after I saw "Dead Man Walking.” I remember thinking, “I have to speak up against capital punishment.” And so my first protest was in high school for a local person in Rochester, New York, who was facing capital punishment. Later, through college, I was active with the G8 summit. I think the more we just keep having coffee and beers, the better off we are. I wasn't organizing, you know; I was just participating. And I can remember CBC, the local news in Canada, stuck a microphone in my face as we were being tear-gassed and said, "How's it feel to be a person in a wheelchair just having gotten tear-gassed?" and I was like, "Well, I think it feels like everyone else around here because our eyes are burning and we're all feeling tight in the chest." When it comes to working and advocating for different community groups, there's a lot of discussion about using "person-first" or "identity-first" language. I'm curious where you stand in that discussion. Yes. Well, it's interesting that you raise that question because I think I struggle with knowing that part of my identity – still to this day, in my 40s. I appreciate both sides, and so of course it's a very personal preference. And I've kind of enjoyed sitting on the fence. Often, I refer to myself as “a person living with the disease spinal muscular atrophy” over “a person with a disability.” So I guess that’s typically people-first. What’s it like to be in a community where there's discourse coming from very different sides of the fence, and how do you navigate that? Yes. I think that's an art I'm still willing to take on, you know, learning and navigating that. 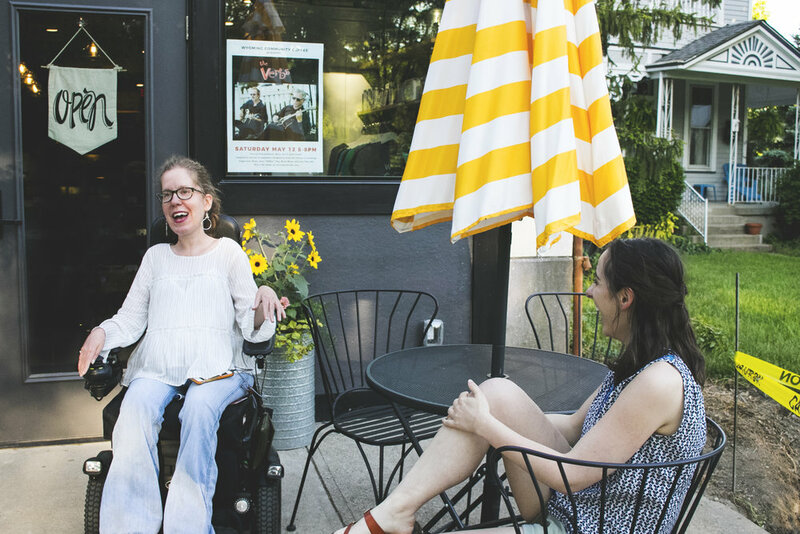 There are not always people living with disabilities – whether it's physical or whether it's hearing or vision or cognitive – at the table. In my work with people that do not identify as disabled, I'm often representing my voice as a person with a disability, a severe physical disability. And it's only my story, so I can only speak from my point of view. What can women's organizations, communities, and groups do to ensure the spaces that they create are inclusive? Have leaders within those communities at the table. And they don't need to be someone that's read a book or who has a Ph.D. in women's studies or whatever; they need to be having life experience. So how do we find each other? In the age of social media, it should be so easy, but we're still very siloed. That's the million dollar question, really, and we are sort of breaking down those barriers just as long as we keep talking. I think the more we just keep having coffee and beers, the better off we are. My muscles were depleted, just completely depleted. It was a beautifully empowering experience at the same time. What do you think is a good first step for Cincinnati and our community in getting people's voices at the table? I think conversations like this: these are leading to something that maybe I haven't considered. I think it's really in communicating. It really, really is. And listening. I need to listen. I have so much to learn from you, because you have lived experience. You never know what someone's story is. Maybe more people should ride the bus, I don't know; then we'd be having conversations with strangers. I don't know if there's like, a fast fix. I think it's going to be slow and involve a lot of talking and reflecting later. And then: really doing things. It wasn't easy flying to D.C. But if we all just really make ourselves part of actions then it's not just empty words. Oh, no not at all! Please go ahead. Well, there are very different travel experiences between us. So, what made you decide the effort was worth it to go and protest multiple times? Okay, absolutely, right. So, the experience was exhausting emotionally and physically. I would come home and just sleep. I wasn't able to do things that I was typically able to do, like brushing my teeth. My muscles were depleted, just completely depleted. It was a beautifully empowering experience at the same time. You know, Ady Barkan always said it's empowering to be participating in democracy right in our house, like right there in D.C. And, despite our efforts not being fruitful – as you know, things were passed and we didn't get a win in the books – we really made so many wins just as far as the relationships we built. And the experience alone… I mean, there is nothing quite like civil disobedience that is really as exhilarating and depleting all wrapped up in one. The judge said, basically, "Keep doing what you're doing! Maybe reel it in a little here, but keep doing what you're doing." I know that I had the privilege to use my voice and my body to get to D.C., so there was really no other option than to say, “I'm going,” despite not knowing who was going to get me out of my chair and onto the plane, and from the plane back into my chair. You know, and then one time my chair stopped when I was getting onto the subway; I was half on the deck and half on the subway. So, I was willing to make myself completely vulnerable in order to fight for something that not only I need, but I know hundreds of thousands of people have situations in which they're powerless over the same resource. I was willing to be vulnerable and uncomfortable and not shower, to not know when the next time I would go to the bathroom was, because I knew that I had to be there representing my story, which was the story of so many other people living with spinal muscular atrophy, or any diagnoses that they may have or obtain later in life. We're only one accident away from bankruptcy. Really. What is the craziest thing that you've seen in your activism? [In D.C.,] they never had a wheelchair-accessible police vehicle ready. So we would have to wait. And most of the Capitol police are very cool. One of the head Capitol police officers was helping us organize. Because after we’d go around and do a sit in, we'd know who was getting arrested in front of whose office, and then we’d regroup, and sometimes we would get all split up, and the main guy was helping us reorganize. He was like, "One's over here. Two's over there!" He would whisper like, "Keep doing what you're doing." And when I went back this past February – for I've been arrested too many times – the judge said, basically, "Keep doing what you're doing! Maybe reel it in a little here, but keep doing what you're doing." Do you know how many times you've been arrested? I think five. I mean, it was fun. They don't like it when you get rapid-fire arrests. They don't like it when they keep seeing you; they're like, "Oh God, what's coming next? You mean business." What do you think it's going to take to change the status quo? How do we move forward? I think the more we can reach out to community and let them know that these kinds of things are happening… The Epi-Pen shortage or the housing shortage just make people uncomfortable. Because I think they're choosing, still, to not know because they don't need to know; they're fine. You know, they're going to tennis right now or wherever, or just walking their labradoodle. I really like Helen Keller. No, really, I think she was humble and determined and wanted to know more and to appreciate that there was something bigger in the universe than her. I think she was a really courageous person and I really like her teachings on labor and women and disability. Do you know a woman doing awesome things for Cincinnati? Nominate her here! New features launch every Monday.